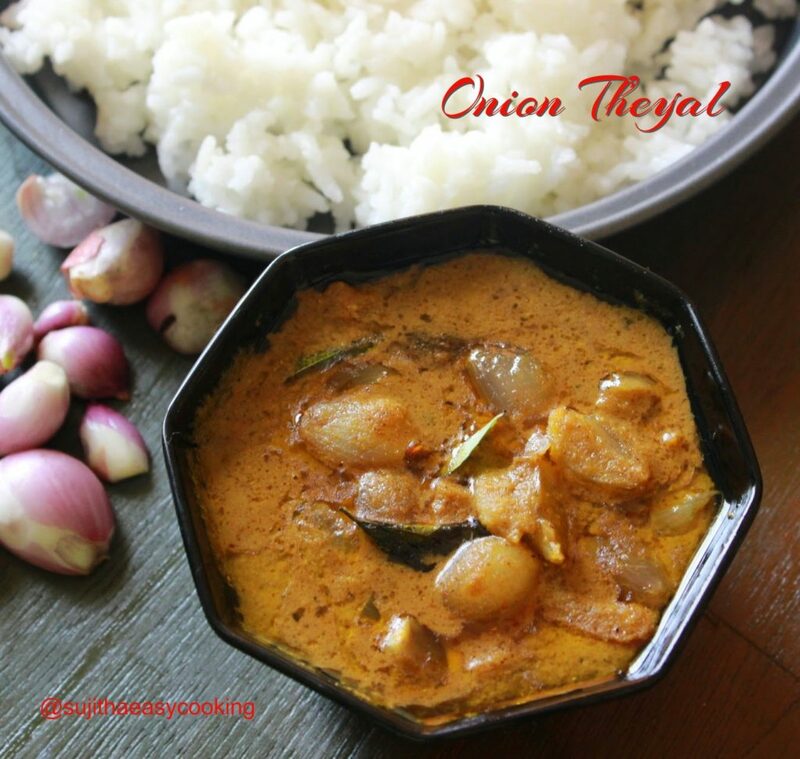 Onion Theyal/Ulli Theyal, One of the delicious south indian Curry.. Roasted coconut paste is the super taste for the curry.. Theyal/Roasted coconut curry/Tamarind curry is our staple dish.. 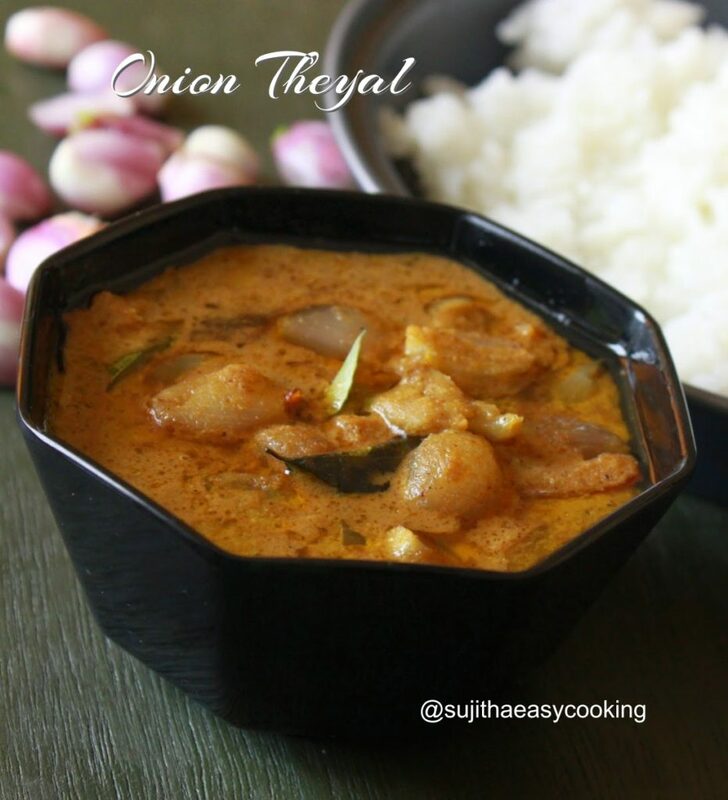 This is completely delicious and yummy finger licking curry, best go with Idli,Dosa, Chapati, Roti, Steamed Rice too.. all kind of poriyal and thoran will suits for it.. this tangy, spicy, delicious curry will stay in mind for ever when u licked once.. Pearl Onion/Sambar Onion had lot of health benefits in it.. early day this will the base for all the curry and kootu.. nowadays for time consuming every one starts to chop the ballari onion and makes their way easy, but once in a wile making this curry will full fill the part of it.. do try and let me know how it turned for you.. lets go with recipe preparation and method..
1. Take all the ingredients n the Roast and grind table, Roast them in low medium flame for 10- 12 mins.. make sure not to burn the content..
2. Make the roasted items to cool and grind it to a smooth paste by adding some water..
3. Heat the kadai with oil and temper it with Mustard, urad dhal and methi seeds, sauté the Onion, Garlic for few minutes till they turns soft.. add in the curry leaves and fry them..
4. Add in the Tomatoes and cook till they mush out.. then add in the grinded masala to it..
5. Add in the Tamarind water and salt, let them boil in medium flame for 10 – 15 mins..
6. Cook in medium flame till they ooze out the oil..
Roast the ingredients carefully, roast it without burning the ingredients.. Grind them to a smooth buttery paste..
Can add some more veg like brinjal and drumstick to it..